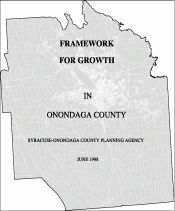 Onondaga County is in the process of creating a new County plan with a focus on settlement patterns that will foster sustainability and provide a region of opportunity for future generations. The plan will guide decision making for County government and will serve as a decision making tool for individuals, businesses and municipalities. It is being created because settlement patterns, the way we build our communities and places, have tremendous, long-term implications for every aspect of our lives and they are fundamental and integral to creating a sustainable region and sustainable neighborhoods. This plan will be closely linked with several other very significant and important efforts that are intertwined with the County’s settlement patterns, including the creation of the County’s Climate Change Action Plan and the update of the Syracuse Metropolitan Transportation Council’s Long Range Transportation Plan. The plan will also be integrated with rapidly shifting Federal and State policies, which have a substantial impact on settlement patterns. This first piece of the plan is a focus on understanding where our County stands today, and the direct and indirect relationships between settlement patterns and our environmental, social and economic sustainability. This portion of the plan is also intended to help us understand our intertwined fates as a region—how our collective decisions, both large and small, have an impact on our earth, nation, region, municipalities and neighborhoods, and on us as individuals. Click here for the latest presentation. A statistically valid survey and other multi-media methods of public input to quantify and understand community sentiment on values and goals as they relate to our current and future settlement patterns and investment priorities. Development of a set of “performance criteria,” based on public input including the survey, and planning best practices, that can be used to assess the performance of various settlement scenarios. It is assumed that these measures will be easy to understand and valuable for citizens in decision making. Development of a projected future year scenario map to reflect existing settlement plans and anticipated urban expansion. Development of one or more alternative scenario maps that reflect different settlement patterns, based on the goals and values presented through the public survey and input phase and planning best practices. Analysis of the different scenarios using travel demand modeling and mapping software, based on the performance criteria developed prior. Outputs will be used to compare the performance of each scenario against identified goals. Public presentation of the results of the survey and modeling efforts, to foster community understanding on the fiscal, environmental and other impacts of different choices we can make in settlement patterns. This portion of the plan will identify the necessary components of a sustainable region, including the decisions and discussions that must occur in order to achieve the vision at all scales including the region, municipality, neighborhood, and individual. The plan will present specific policy objectives for County operations as well as opportunities and guidance for municipalities, business, and individuals. Ongoing coordination and innovation will be the key to the region’s future. This plan will create a venue for educating community leaders and citizens on techniques to improve our settlement patterns and as a result reduce our carbon footprint, make transportation more efficient and affordable, optimize infrastructure and tax dollar investments, protect our natural environment, secure local food sources, create healthier communities, and create sustainable economic development opportunities. 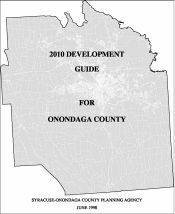 Please check back for periodic updates, news, and opportunities to become involved in shaping the future of Onondaga County.